Among the pioneers who during the first decade took up land in the section now known as Warren, were some of the town's most influential men …. For example, … Justus and Homer Sackett; …. In 1750, … petition was made to the General Court and permission was granted for the establishment of a new ecclesiastical society … known as "The Society of East Greenwich in the Town of Kent" …. On July 13, 1750, in the house of John Finney, the new Society held its first meeting. Nathaniel Swift, Jonathan Brownson, and Benjamin Sackett were elected a Society's Committee to proceed with the organization of the church, while Jonathan Sackett and Jeremiah Fuller were appointed a committee to supply the church with preaching. It was probably in the home of Jonathan Sackett, which stood near the present Sackett homestead, that the organization of the Church was finally achieved six years after the Society had come into being. … September 22, 1756—the day for the "gathering" of the new church … covenanting members [18, including] Jonathan Sackett, Jonathan Sackett, Jun., Justus Sackett. By the close of the year ten more had "owned the covenant": [including] Hannah, wife of Jonathan Sackett, Jr. The following year  Jonathan Sackett and Jeremiah Fuller were again appointed a committee to select a minister. In 1776 Justus Sackett was sent to the General Court "to git a committee to Stake A place to Set sd house" [a proper meeting house to replace the little schoolhouse]. List of Pew Holders in Old Meeting House, 1816 [included] Justus Sackett, Moses Sackett, Benjamin Sackett, Homer Sackett, Alexander Sackett, Aaron Sackett. Adjustments to the seating were often necessary, perhaps to satisfy the complaints of disgruntled parishioners. For example: "Voted to move … Esq. Sackett and Capt. Carter to the East side of the Great Door … Alexander Sackett and Sylvester Finney to the South East Piller Pue …. List of Pew Holders in New Meeting House, 1822 [included] Benjamin Sackett, Homer Sackett, Justus Sackett, Aaron Sackett, Moses Sackett, Alexander Sackett. Reminiscences of Mrs. Lucy Sackett Huth, quoted by Miss Agnes Strong in an article entitled "Social life of a Generation Ago," read on Old Home Day, September 2, 1911: "The teacher of the singing school would come for a certain number of weeks for a certain sum, and each family would give according to the number who attended …"
The Sackett homestead* was commonly known as 'Sackett's Harbor', because no one was ever refused shelter there. [Footnote:] *The home of Justus Sackett stood south of the "Stone House" on the now discontinued road which led through "Hardscrabble" to Litchfield. Across the road was the cheese factory. Lucy was one of the six lively "Sackett girls". When the ladies of the church ripped open the cover of the pulpit cushion, they found [a paper which read:] "In the year of our Lord 1845, under the presidency of James K. Polk, and the Governorship of Roger S. Baldwin, and in the second year of the pastorate of Rev. John R. Keep, the ladies of Warren observed that the pulpit cushion, under the influence of twenty-five years of sound orthodox preaching, had, in the language of our predecessors, 'turned to rags'. … On Thursday, the 7th of August, assembled, for the purpose of recovering the cushion, Mrs. Jane Sackett Hine, Mrs. Emily Sackett Comstock, Misses Laura Taylor, Lucy C. Sackett [and 5 others] …." … in 1937 a Restoration Committee was appointed, Miss Edith Sackett chairman, and a comprehensive plan of restoration was undertaken. On the last Sunday in September, 1955, the annual Old Home Day was observed once again by church and community. 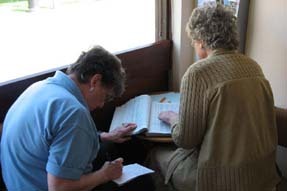 … For some fifteen years before this Old Home Day the Restoration Committee, under the leadership of Miss Edith Sackett, whose ancestors played so large a part in the early history of the church, had been hard at work. Although Warren Sacketts, and perhaps other families, settled in the town of Warren, Ohio, the name of that town bears no relation to that of the Connecticut town, the name having been chosen in honor of Moses Warren, who was a surveyor in the party of Moses Cleaveland when the Western reserve was surveyed. From the history of the church in Ruggles, Ohio, comes the following story of courage and devotion: "This church was organized Thursday, January 11, 1827, as the First Congregational church in Ruggles with a membership of eleven persons [including] Harvey Sackett, Thalia Sackett. … they … gathered at the home of Harvey Sackett to organize a church where the articles of faith were adopted." [Arriving in Tallmadge, Ohio, in 1816, from Warren, Connecticut, the family of Warren and Lucy Sturtevant] while they were building their cabin, stayed at the home of Deacon Salmon Sackett, an earlier migrant from Warren. [Six years later] in the summer, when a swarm of bees appeared, Mr Sackett hived them and gave them to the boys with the remark that though they probably wouldn't live through the winter, perhaps they would furnish a bit of sweetening. The [Sturtevant] boys tended the bees carefully. Honey and beeswax were cash articles, and with the money they brought Julian and his brother began their college career. 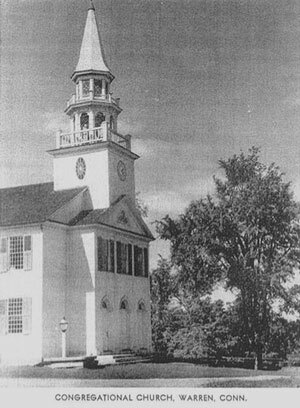 Lucy Sackett Curtiss, The Congregational Church, Warren, Connecticut, 1756–1956. (Published 1956).